The Newfoundland breed takes its name from the Dominion of Newfoundland (currently a part of Canada) where it originated. Many Newfoundland name their dogs after a place within this region of Canada. Brighton, Embree, Kippens, Ramea, and Trinity are a few names borrowed from towns in Newfoundland and Labrador. Mundy, Harp, Vidi, and Victoria are names inspired by lakes in the area. 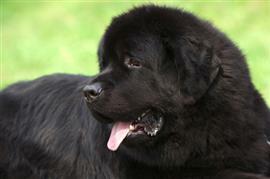 Compared to most breeds, people consider Newfoundlands to be giants. Various mythologies provide a slew of fun giant names. A few giant names from Celtic mythology include Balor, Elatha, Tethra, Fachen, and Bres. Norse mythology lends Bestla, Gorm, Gilling, and Loki. Many great options from Greek mythology include Athos, Echion, Talos, Atlas, Cronus, Dione, Phoebe, Rhea, and Themis. Other famous giants of various origins include Anakim, Og, Goliath, Ferragut, Kapre, and Kroni. With a resistant coat and webbed feet, the Newfoundland is known for its great swimming ability. Names borrowed from famous Olympic swimmers include Gould, Otto, Phelps, and Fraser. Some of our pages will contain a subcategory. A subcategory is a slightly more specific grouping than the main topic of the page. For a subcategory, we will include a separated table of names and corresponding descriptions. An example of a subcategory of Red Dog Names would be 'Dog Names Inspired by Red Wines'. If you have any subcategory ideas for the Newfoundland Names page, we would love to hear them. Use the form below to submit your ideas.